The retail industry has gone digital, and the way a brand interacts with customers online is constantly evolving. More than 5,000 attendees gathered at this year’s Shop.org’s Retail’s Digital Summit to hear from expert speakers and companies providing digital tools for the retail industry. The event took place Monday, Sept. 26 through Wednesday, Sept. 28 in Dallas. One of the highlight keynote speakers was Shinola’s president Jacques Panis. He discussed the story of Shinola – which is based in Detroit – and the customer experience both in-store and online. The upscale retail company, which makes watches, bikes, and leather goods, uses Detroit at the forefront of their marketing and advertising… because creating hundreds of manufacturing jobs in a city that went bankrupt in 2013 is a compelling story. Although Shinola has been criticized for being inauthentic by journalists, bloggers, and the FTC, the combination of Shinola’s story and its in-store experience has created the successful Shinola brand. Panis says storytelling is how Shinola recreates the in-store experience online. The future of retail was the subject of another noteworthy session from consulting firm PSFK. Piers Fawks, president and founder, and Scott Lachut, president of research and strategy discussed the impact of mobile and social media. PSFK has identified 10 pillars for using technology to create a connected customer journey, according to an article about the session. One of the pillars is to “encourage advocacy” – to encourage loyal customers to talk about your brand online. For example, according to the article, Tesco Bank has set up channels for customers to talk about their finances. Other keynote speakers included Alon Cohen, president and co-founder of Houzz; Shelly Palmer, managing director of Palmer Advanced Media; Mike Amend, executive vice president of Omnichannel at JC Penney; Johnna Marcus, senior director of Sephora Innovation Lab; Reshma Saujani, founder and CEO of Girls Who Code. 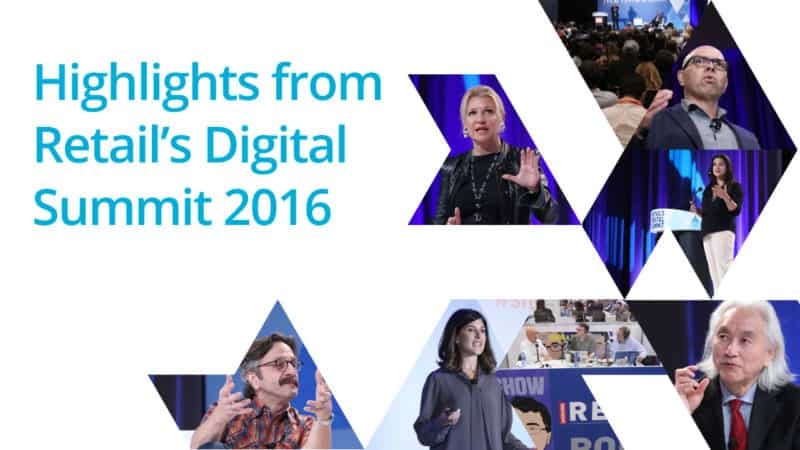 Check out the full list of recap content from Retail’s Digital Summit here.